Basement clean out. Yes, it will take plenty of time and effort. But, if it’s done right, will payoff in the long-term. Especially if you’re going to finish the space to remake it into usable living area, adding more function and value to the home. So, be sure to plan accordingly and think it over before you rush into it. 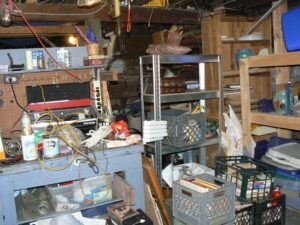 Then, take a look at some of these basement clean out tips and tricks. Homeowners do basement cleanouts for many reasons. Primarily, it’s to reclaim precious space, whether it’s for more storage, a laundry or mudroom, a combination, or living space. But once it’s done, you can make better use of the room. Do a little research to find nearby homes that have sold in the past few months. Look for properties with what you want in your own house. For instance, if you want to rework the space to accommodate laundry and storage, look for recently sold homes with the same amenities. Clear a pathway. If you do not have a walkout basement, you’ll need to do yourself a huge favor and clear a walking path from the steps to the front or back door. Basically, you need to have a clutter-free walking path so you can work without tripping or negotiating obstacles. Remove and separate items. Empty the basement, beginning with the area closest to the exit. Then, work your way incrementally toward the back so you create more space as you go. Purge, purge, purge away. Once the basement is empty, it’s time to purge with a vengeance. To provide yourself motivation, just keep in mind that what you keep you have to find room to put back. If you need a basement clean out done right, please phone 800-433-1094 or visit Junk Garbage Removal.